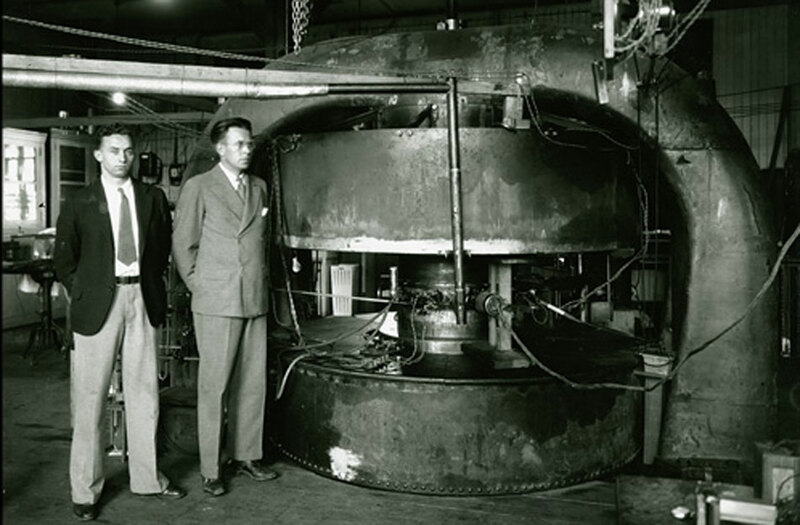 Ernest Lawrence (right) and colleague beside the 27-inch cyclotron, 1932. Courtesy: Lawrence Berkeley National Laboratory. Ernest Lawrence was an American physicist who in 1929 conceived and in 1931, with colleagues, built the first cyclotron at the University of California at Berkeley. Lawrence went on to develop larger cyclotrons, capable of operating at higher energies, and his work in this area earned him the 1939 Nobel Prize in Physics. The element lawrencium was named after him, as was the Lawrence Berkeley Laboratory. In 1936, having recognized the potential use of nuclear isotopes in medicine, Ernest Lawrence persuaded his brother John to join the Berkeley Laboratory to develop this new field. In that same year, John treated a 28-year-old woman, suffering from leukemia, with phosphorus-32 that had been produced in Berkeley's 37-inch cyclotron. He then went on to spend the rest of his career in nuclear medicine at Berkeley.